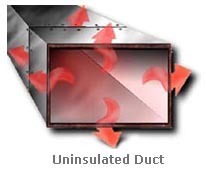 Conductive heat loss through the ducts is typically as great or greater than losses from air leakage. Ducts running through unconditioned spaces like an attic or crawlspace should be insulated. If the ducts are in a basement, you will have to weigh the fact that insulating them will make the basement colder. If both the ducts and the basement walls are uninsulated, consider insulating the basement walls instead of the ducts.